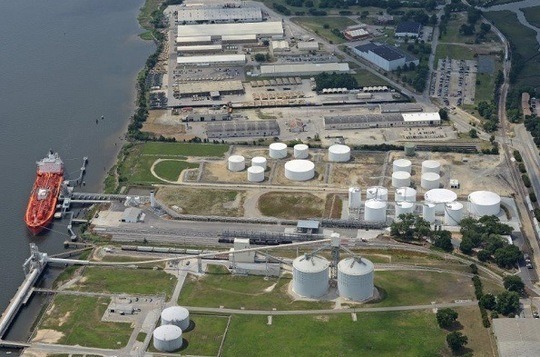 A premier service provider to the liquid bulk chemical industry for over 30 years, Odfjell Terminals Houston (OTH) provides unsurpassed storage, transfer and distribution services. Our sophisticated Houston terminal is strategically located near the entrance of the Houston ship channel, the major international hub for import and export of chemicals to and from the USA. OTH is one of the most sophisticated chemical tank terminals in the world, and the hub for Odfjell’s global and regional trades to and from the US Gulf. The tank terminal was completed by Odfjell in 1983, and boasts one of the largest stainless steel storage capacities of any independent tank terminal in the world. The facility has spheres to handle LPG, and with its pressurized tanks, nitrogen compensation systems and an advanced vapor return system, OTH offers a broad range of services. The terminal is easily accessible for sea-going tankers, barges, rail tank cars and road tank trucks. Since the American distribution network is heavily dependent on rail and road infrastructure, OTH is well equipped with broad rail tank car and road tank truck handling facilities. Odfjell has a 51% ownership share in OTH. OTH commercially manages and operates a modern and sophisticated terminal in Charleston, South Carolina. As a result of its industry-leading QHSE standards and operating practices, OTH has earned the trust of the surrounding community, regulatory entities and its customers.